J'adore l'association veste en fausse fourrure + bomber khaki, ça a un petit côté casual chic c'est top! Mi piace molto questo look, bellissimi gli stivaletti! This is lovely, I love the greens and the camo together! Have a nice day, Jeanne! Molto carino questo look! Buona giornata. The look rocks. My favorite piece is the purse. Thanks for sharing buddy. Super cute! I love those pants and all the layers you're rocking! Mi piace tanto sia il gilet che la borsa! I really love that bag! 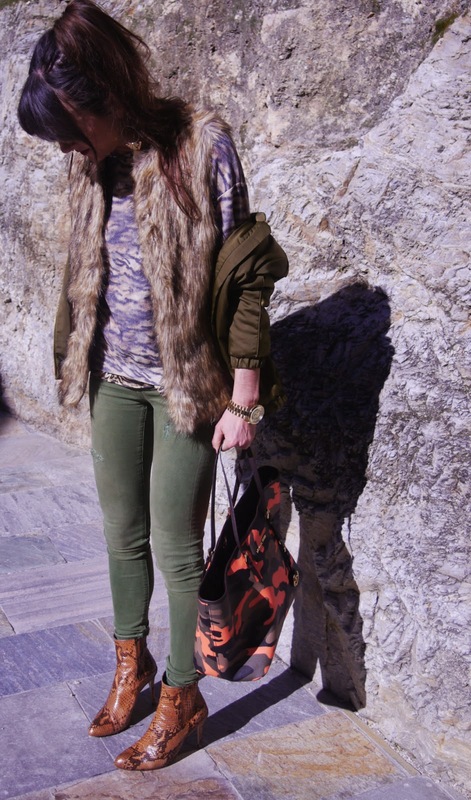 Amazing camo print, I think it is perfect with khaki jacket! Really great look. I especially love the jeans, you've inspired me to go and buy some! This look is fantastic, I love the color combination!!!! So stylish! 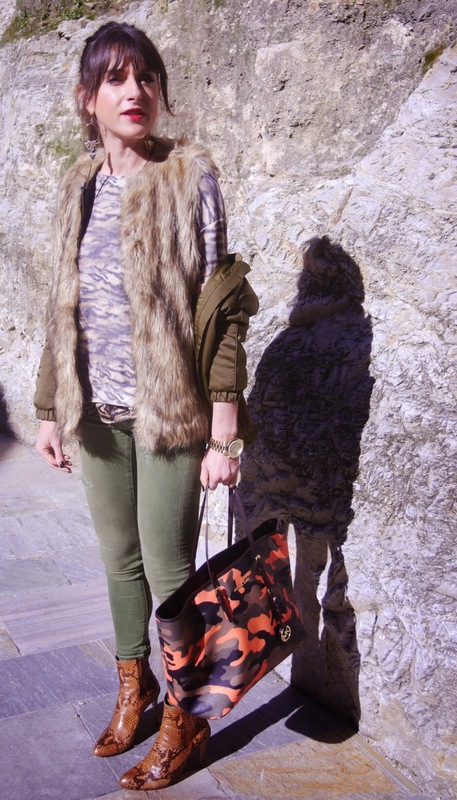 You are right, khaki is still in trend and it does look so good paired with fur jacket! Love the Khaki's , they look fab on you! Love your Jeans and the shoes <3 Great look! I can't say I'm a fan of khaki or if I ever will be (it'll probably grow on me) but I do love your shoes! Yes, yes, yes!! Love your vest my dear. What a fun and unique way to wear fur! 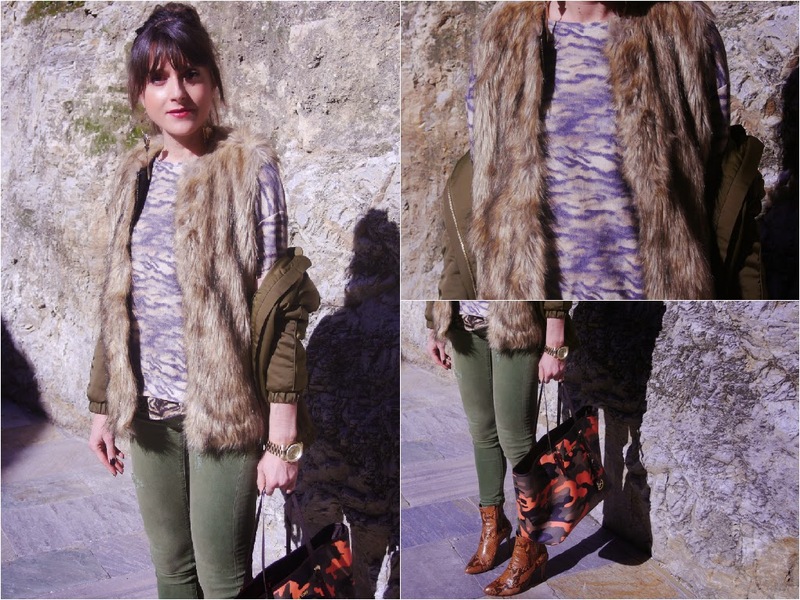 Love your pattern mixing and fur vest!! All of the different patterns in this outfit are sensational! nice style & courageous combination! i like it! 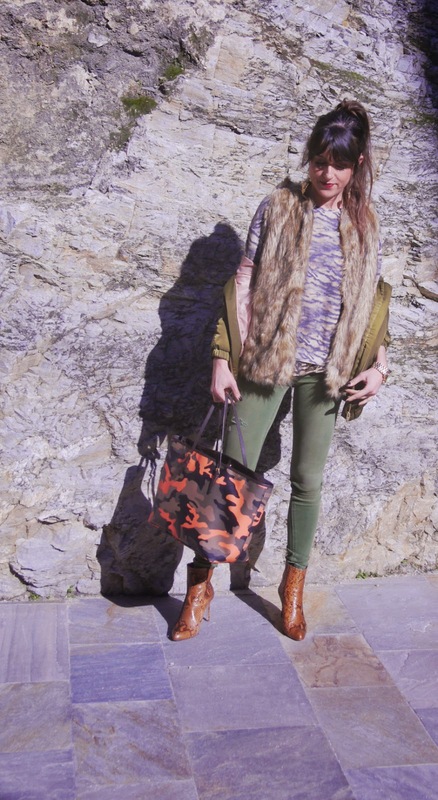 Bellissima borsa; non sono un mante del camouflage in genere ma declinato nell'arancione mi piace molto..
Those khaki pants are SO good for Spring and Summer! I love this more muted looked from you! You look so fabulous! Love everything in this outfit,from the boots to the bag...Nice styling! And that fur coat is a must. I'm not a big fan of khaki, I'm more a very bright/pastel kind of girl, but the colour looks great on you! Love the print clashing also! Your fur vest is perfection!! Love this! 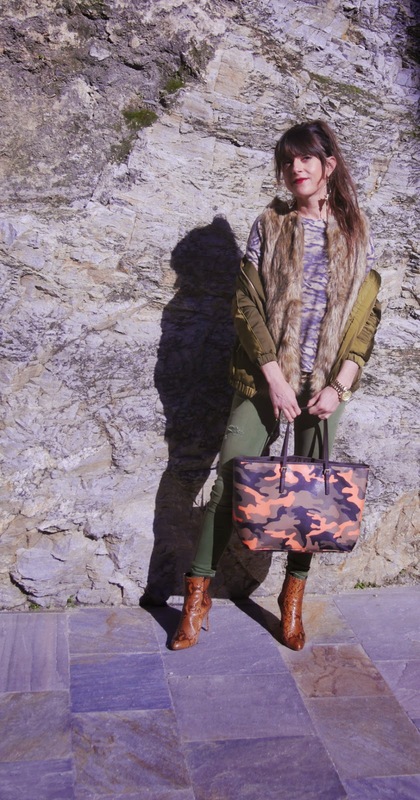 Your style is amazing.. would never have thought to buy a camouflage MK bag but now I'm tempted! What a beautiful outfit dear. The jeans are really pretty. I love khaki colour. I have lots of clothes in it, so I am glad that it's coming back to fashion. I love your pants. I have been looking for army green pants forever. lovely jeans! so elegant and comfy outfit I'm in love with that! Love that outfit, and my ?preferred bag? :) fits greatly!!! I love the camo Michael Kors handbag. beautiful post! Hello Jeanne, I nominated you for the Liebster Award ❤ Please click on this link to go to it. Wishing you a lovely Friday hun. En tout cas tu es canon, et ces tons te vont vraiment bien ! you are stunning!!!!!!!!!!!! so gorgeous.